1928 Petsy Replica Teddy Bear by Steiff. This beautiful hand made piece, in brown tipped mohair, is fully jointed and wears the white ear tag, signifying this item as a Steiff limited edition, together with the famous underscored patinated steel Button in Ear. Limited edition of only 928 pieces worldwide. Product details: glass eyes,wood shaving filling,with growler, size 35cm. Comes boxed, together with a numbered certificate of authenticity. Ashby Bears proudly present TEDDY BEAR PETSY REPLICA 1928. In 1927 Richard Steiff was inspired by the American zeitgeist of the Twenties to produce a bear with a new expression and striking blue eyes. A short time later, on January 7, 1928 Steiff presents the Bear Baby "Buschy". Steiff fans liked everything about him, just not his name. As “Petsy” he was a great sales success. Up until 1930 a total of 10,688 were sold. 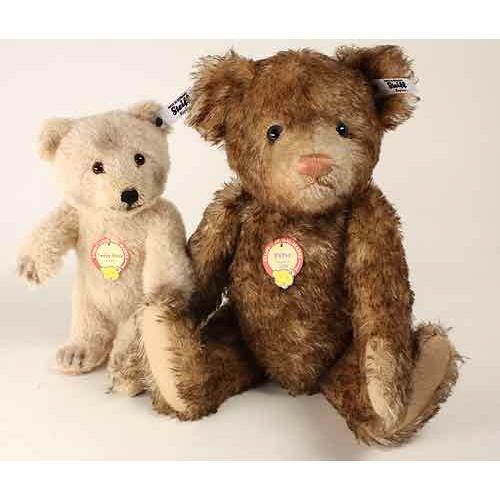 The look of Teddy bear Petsy replica 1928 with a 35 cm standing height, harks back to this famous bear cub. The replica is stuffed with excelsior, has blue glass eyes and "underscored button" made of patinated steel. 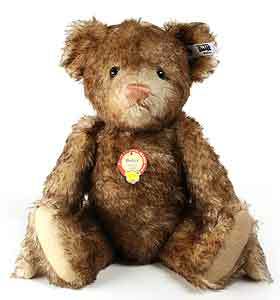 As a tribute to the year of his release we present Teddy bear Petsy 1928 replica in a limited edition of 928 pieces.